Sign up to receive my Studio News Newsletters! 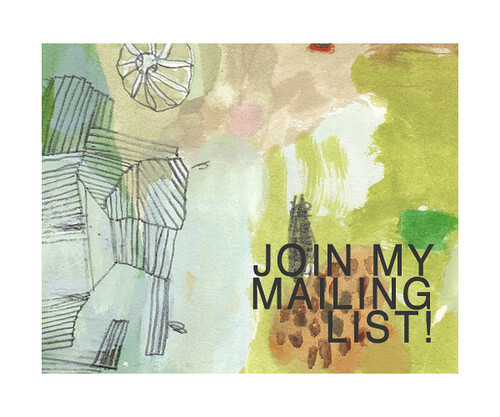 Recently some of you have been emailing me, asking to be added to my mailing list. Since I haven't ventured into the realm of sending email newsletters in the past, I decided to set up an account with Mail Chimp. Now I can keep you informed with goings on and events in my Studio News newsletters. They will be delivered to your inbox with info about my book, exhibitions and/or shop updates. So please SIGN UP here if you would like to be the first to get the news! And just a note, I have not already automatically added anyone, friends or past customers, because I want to make sure you want to receive these letters. And of course, any information you provide is strictly confidential. Also I've added a button in the sidebar here at my blog and a link on the main page of my website enabling you to access the sign up form at any time. The first newsletter will be going out very soon, so don't miss it!